The cereal leaf beetle, Olema melanopus, was introduced from Europe into Michigan in the 1950s and is slowly spreading southward. It is now well established throughout the northern half of Alabama and Georgia and is partially established in the southern half of both states. In recent years, the cereal leaf beetle has been a sporadic pest. 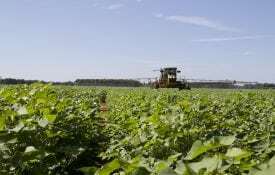 Each year some fields will have pests that need to be controlled. The immature stage of cereal leaf beetle feeds on the leaves of wheat, oats, and certain other grasses. The cereal leaf beetle has one generation per year. Adult beetles spend the winter in the woods and field borders. During the first warm days of spring, the beetles disperse into small grain fields, mate, and begin to lay eggs. Eggs hatch in about 7 days, and larvae (immatures) begin to feed on the cereal leaves. Larvae are usually first found after flag leaf emergence but before the heads have emerged. The larvae feed for about 3 to 4 weeks and then leave the plant and move down into the soil. Cereal leaf beetles transform from the larval to the adult stage in earthen cells in the upper 2 inches of soil. This transformation (pupal) stage lasts 10 days. The adults of the new generation come out in late May and early June, feed briefly, then move out of the fields and remain inactive until the following spring. New generation adults may feed on corn leaves but seldom cause serious damage. Cereal leaf beetle adults are about 3/16 inch long and 1/16 inch wide. The adults have dark, metallic blue wing covers, orange legs, and an orange collar. The head and the rest of the body are black. Eggs are cylindrical with rounded edges. They are light orange when laid and darken gradually over time to almost black. Eggs are deposited singly or in rows of two to four on the topside of the leaves. Each female lays from 12 to 50 eggs. 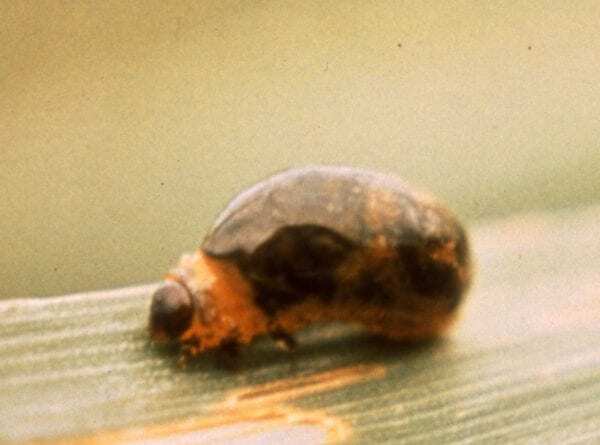 Cereal leaf beetle larvae are pale yellow with a brown head and legs. In the field, they look mostly black because they smear their excrement over their bodies. People walking through a field infested with cereal leaf beetle larvae may emerge with black-stained pants legs because this black coating easily rubs off the larvae. The larvae are about 1/16 inch long just after hatching and 1/4 inch long when fully grown. Cereal leaf beetle larvae feed on the leaves. 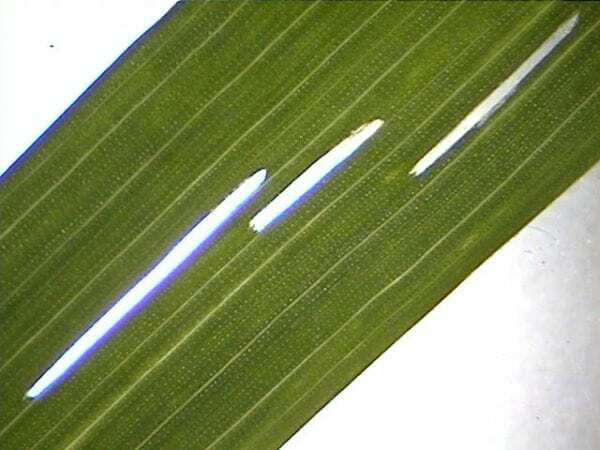 Feeding activity results in long, window-like slits in the leaf blade (figure 4). 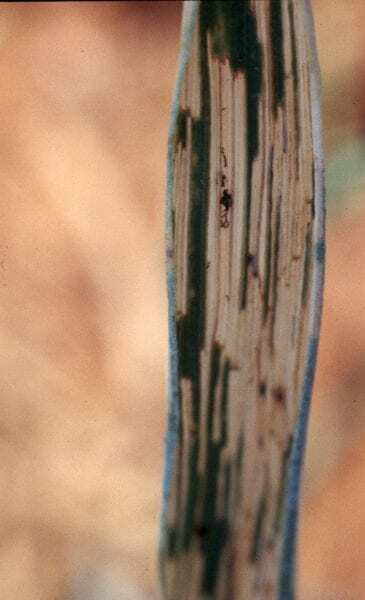 When feeding is severe, the entire leaf becomes brown and ragged. Cereal leaf beetle larvae are especially damaging when they feed on the flag leaf and when large numbers of larvae are found before head emergence. Begin checking for cereal leaf beetle adults, eggs, and larvae in early March in the vicinity of Talladega County, Alabama; mid-March in the Tennessee Valley region; and late March or early April in northern Georgia. Check the middle of the field as well as the edges. One way to check fields is to walk back and forth in the field in a zigzag pattern. Look for adult feeding damage, adult beetles, eggs, and larvae. Stop in five to ten areas in each field, and count eggs and larvae on the top two leaves of five stems. 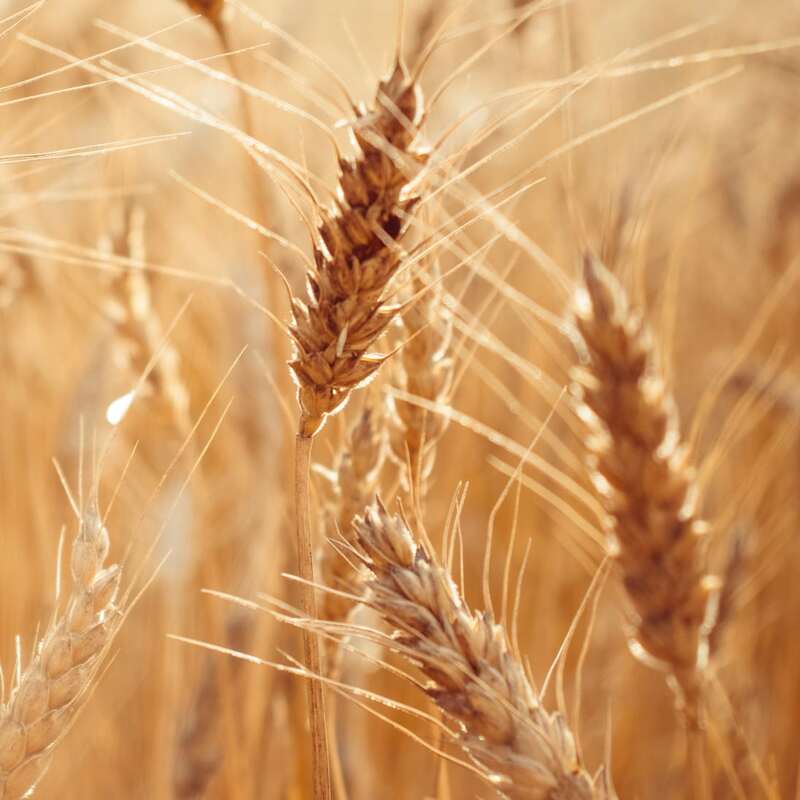 If cereal leaf beetle larvae have begun to hatch and there is more than one cereal leaf beetle egg or larva per two stems, treat with insecticide that is legal to use on wheat. 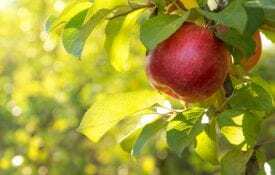 Because dying larvae are hard to distinguish from living ones, wait 2 to 3 days after treatment before checking to make sure the treatment was successful. Warrior II can be applied before any cereal leaf beetle eggs have hatched. Other pyrethroids may have the same effect. When treating before eggs have hatched, treat if there is more than one cereal leaf beetle egg for every four stems. A cereal leaf beetle treatment can be tank-mixed with a foliar fungicide if the time is appropriate. Check the latest version of the Alabama Pest Managment Handbook or the Georgia Pest Management Handbook for insecticide rates and for the latest recommendations for this pest. 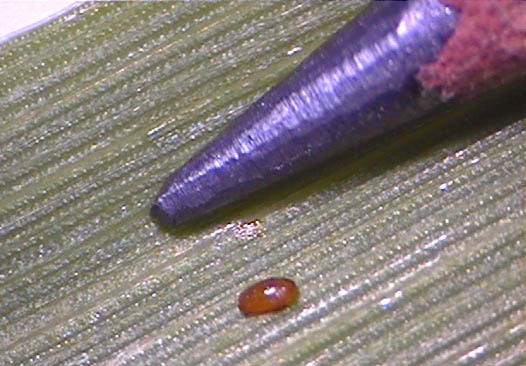 Figure 5: Cereal leaf beetle adults often feed on wheat. Their feeding scars are hollow and thinner than those caused by the larvae. Beetles prefer thin stands so follow good agronomic practices that promote full stands and high-yielding wheat. Also, avoid late planting because adult beetles typically prefer less mature plants to more mature plants. Heavy rains can kill immature cereal leaf beetles. 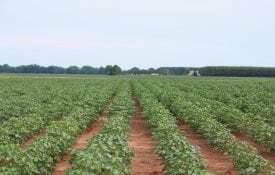 If heavy rains occur between the time a field is checked and insecticides are to be applied, wait for the foliage to dry and check the fields again. 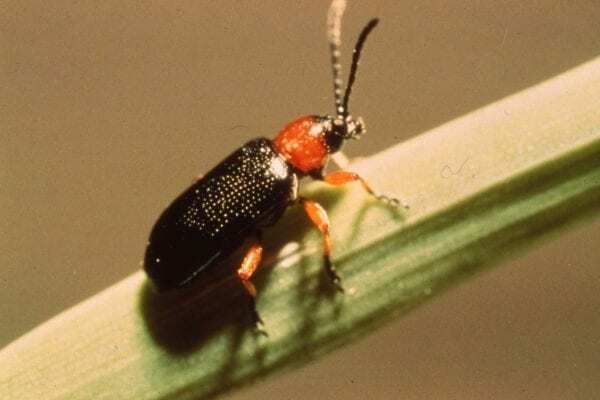 Cereal leaf beetles are controlled by natural enemies in the northern United States. 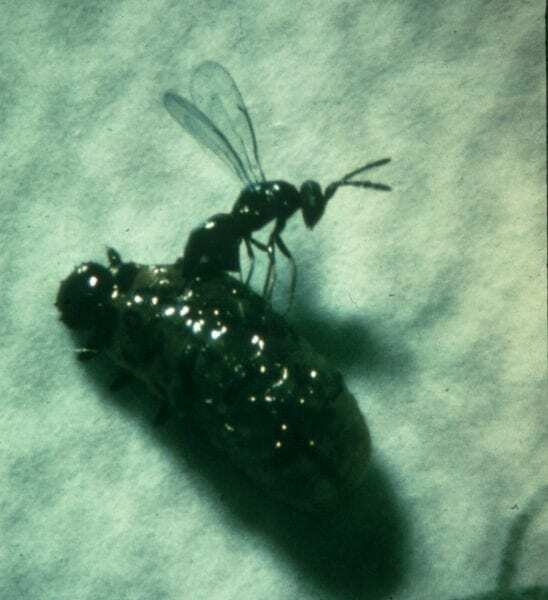 In the late 1990s, the USDA Animal Plant Health Inspection Service, the Alabama Cooperative Extension System and the University of Georgia released stingless wasps that attack cereal leaf beetle eggs and larvae. In 1999, Tetrastichus julis, which attacks cereal leaf beetle larvae (figure 6), was established in Crossville, Alabama. This parasitoid has two generations a year. Greatest parasitism is observed on late-season cereal leaf beetle larvae. A small wasp called Anaphes flavipes that attacks eggs was released in multiple locations in Georgia and Alabama, but it failed to establish. Ladybird beetles are also important predators and can destroy many eggs and larvae. Pyrethroids: lambda-cyhalothrin (Warrior II)*, gamma-cyhalothrin (Declare), zeta-cypermethrin (Mustang Maxx), alpha-cypermethrin (Fastac EC)*, beta-cyfluthrin (Baythroid XL), cyfluthrin (Tombstone)* All pyrethroids are restricted use insecticides. lambda-cyhalothrin + chlorantraniliprole (Besiege) Besiege is a restricted use insecticide. methomyl (Annihilate LV)* Annihilate LV is a restricted use insecticide. * Other trade names are available. Download a printable PDF of Cereal Leaf Beetle; A Pest of Small Grains, ANR-0984.